I have had this exact model Chaparral for about six months now and it has been my office/suit knife (occasionally ousted by my Alox Cadet). I love this little knife the only small complaint I have is that I wish the lock bar was smoothed out – the straight thin metal can start to hurt after awhile if I have been opening and closing the knife a lot. Not the biggest concern, as I said I love this knife. Great value too at just around $100. Keep up the good work! Thank you, Andrew. Yes the lockbar is a little sharp – just like the Spydie hole. I agree, would be nice if there was a way to soften that a little. Thanks again. I’m sure you could take it apart and smooth the edges of the lock bar – a bit of work with a file followed by “shoe shine” style work with some sandpaper… somewhat time consuming, but cheap and easy! Absolutely. Not a bad idea at all if you don’t mind getting your hands dirty. I really love the look of this knife, but I can’t stand back locks. They really bother me, as I can’t really get used to them. Only reason I haven’t jumped the gun and purchased one. Still a favorite EDC carry after several years, excellent slicer, perhaps my favourite grip for a smaller hand (remarkably similar profile to my Strider PT CC), beautiful fit/finish, more pocketable than Sage 1 and highly recommended!! Thanks for stopping by and taking the time out to comment. The Chaparral remains an awesome EDC option for the reasons you described (among many more). I am glad to hear you are enjoying yours after several years of carry. Here’s to many more. 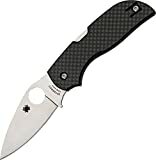 Spyderco came out with a lightweight version with FRN handles, the lightness of this knife with it’s skeletonize stainless frame, and extremely thin blade of high quality steel make this a super EDC, this baby can slice like no other. Also if you look down on the top of the closed knife, you will see the blade runs very close to both ends of the handle, the blade length to handle is amazing, almost Dragonfly sized when closed, almost Sage like opened.